The Council on Tall Buildings and Urban Habitat has just announced the winners of its annual “Best Tall Building” awards for 2011. 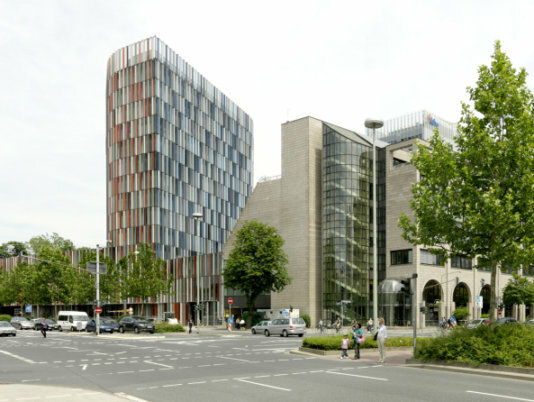 The most interesting one is the KfW Westarkade, located in Frankfurt, the most energy-efficient office tower in Europe. This just in: The Council on Tall Buildings and Urban Habitat has just announced the winners of its annual “Best Tall Building” awards for 2011. These awards recognize outstanding tall buildings from each of four geographical regions, and this year is awarded to: "New York by Gehry" at Eight Spruce Street, New York (Americas); Guangzhou International Finance Center, Guangzhou (Asia & Australasia); KfW Westarkade, Frankfurt (Europe); and The Index, Dubai (Middle East & Africa). The most interesting one is the KfW Westarkade. Located in Frankfurt, it hopes will be the most energy-efficient office tower in Europe. The new addition to the company's Frankfurt headquarters by architects Sauerbruch Hutton is an aggressively engineered and colorful tower which is aiming for an astonishingly low energy consumption of 7 kW hr. per square foot each year. That's more than two times more efficient than what a typical office building consumes in a year. the occupants also benefit as the building is naturally cooled by fresh prevailing breezes thanks to a unique double skin composed of thousands of computer-controlled windows which let just the right amount of air in. The shape of the building is angled to let the prevailing breezes slip by, reducing uneven air pressures across its surface. Environmental monitors on the exterior and interior calculate when and how much the exterior windows should open, accounting for wind direction, temperature and speed. The incoming air pressurizes the envelope sending fresh air evenly through floor vents around the exterior floor plate. All of this engineering effort is to reduce cooling equipment demand to just for a couple of months of the year and supply healthy air without creating a disruptive breeze, especially near the windows. The double windows also cut incoming heat gain significantly while still providing ample natural light. The building also uses waste heat from the server rooms to preheat floor slabs and it distributes heat efficiently via a raised floor distribution system. One day, this will be perhaps the standard, but for now it is a marvel worthy of prize.